The Chelsea Bird china pattern by Mottahedeh inspired the overall look of the table. Paired with it are a masterful selection of complementary patterns: a Versailles Gold Charger, an Elizabeth Dinner Plate and a Chandigahr Dessert Plate, all three by Mottahedeh’s Robert Haviland and C. Parlon brand. Alston notes the charger is French, the dinner plate is Russian, the salad plate is Chinese and the bread-and-butter plate is English. Vita tall coupe glasses in rose by William Yeoward and Olympia candlesticks by Crystalite Bohemia add effervescence to the table. The earliest coupes, designed for champagne and sparkling wines, date back to the 1600s and were popular in the United States in the mid-20th century. Are they poised for a comeback? A chance meeting led to the collaboration that created seat cover patterns. Alston met artist Valerie Lynn at a conference and knew she would be perfect to create designs based on the Chelsea Bird pattern of the bread-and-butter plates. Welcome spring with a dinner party inspired by designer Jo Ann Alston’s Seasons of Hope tablesetting. Spring is more than just a change of season. “It’s full of life and new beginnings,” designer Jo Ann Alston says. That’s why she chose a spring theme for the tabletop display she designed for the recent Seasons of Hope fundraiser for the American Cancer Society’s Hope Lodge in New York City. The lodge offers a home-like place to stay for the families of cancer patients being treated at New York City medical facilities. For Alston, the only New Jersey-based designer invited to participate in the event, the chance to celebrate the season of renewal and to support Hope Lodge was personal, having experienced herself during a loved one’s illness the trauma that families of cancer patients can endure. “It changes everyone, not just the cancer patient, and leaves a permanent impact on their lives,” says Alston, a state-certified interior designer, allied member of the American Society of Interior Designers and design director of J. Stephens Interiors in Far Hills, New Jersey. Alston turned that into positive energy by choosing dinnerware, linens and floral arrangements that salute life, rebirth and beauty. 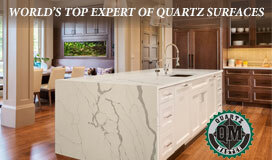 Let the ideas behind her selections inspire your own celebratory spring dinner party. The inspiration for the uplifting mood was the colorful Chelsea Bird bread and butter plates by Cranbury-based Mottahedeh. “It just speaks of spring,” Alston says. 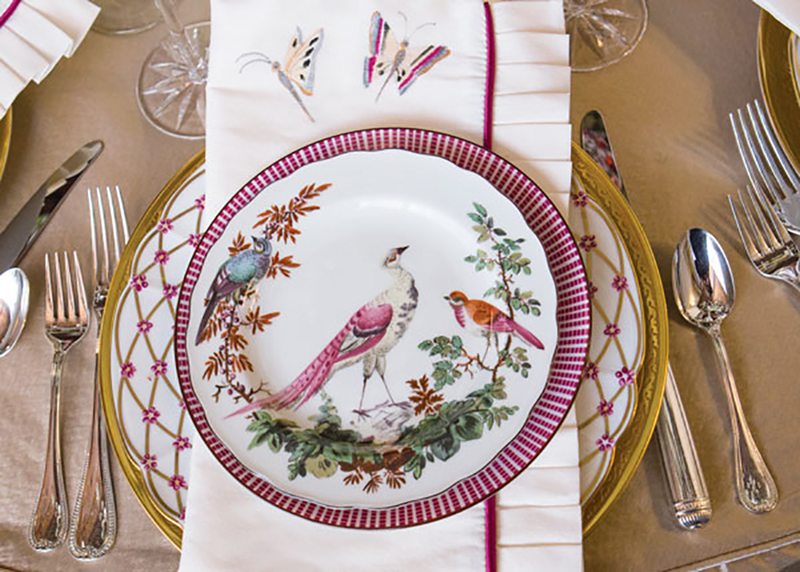 Under the Chelsea Bird plates are a Versailles gold charger, an Elizabeth dinner plate with a trellis-like pattern on the rim and a Chandigahr dessert plate, all three by Mottahedeh’s Robert Haviland and C. Parlon brand. Next came the decisions on flatware (Malmaison by Christofle), glassware (Vita tall coupe in rose by William Yeoward), candlesticks (Olympia by Crystalite Bohemia) and linens. “I had already designed the napkin in my head with a butterfly theme and a box-pleat dressmaker detail,” Alston says. She placed the napkins between the china so the butterflies would show front and center and the pleats would be visible along the side. 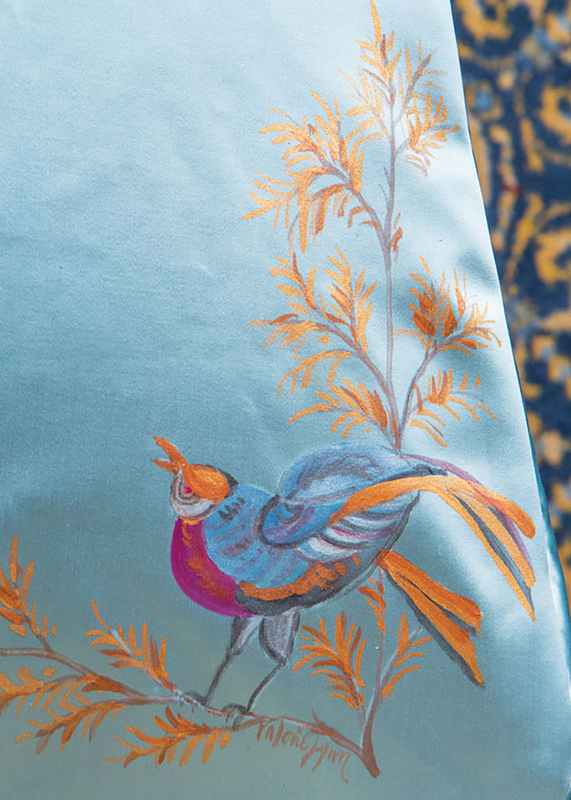 Alston had met artist Valerie Lynn of Valerie Lynn Design at a conference and knew she would be perfect to hand-paint the butterflies on the napkins and elements of the Chelsea Bird pattern on silk seat covers. Lynn painted the design on the corners of the seat covers rather than the center so diners could enjoy them while seated at the table. To add to the visual feast, Alston created a high/low setting with crystal candlesticks and votives. She worked with Laura Clare Design in Bernardsville, NJ to do the same with the floral arrangements. 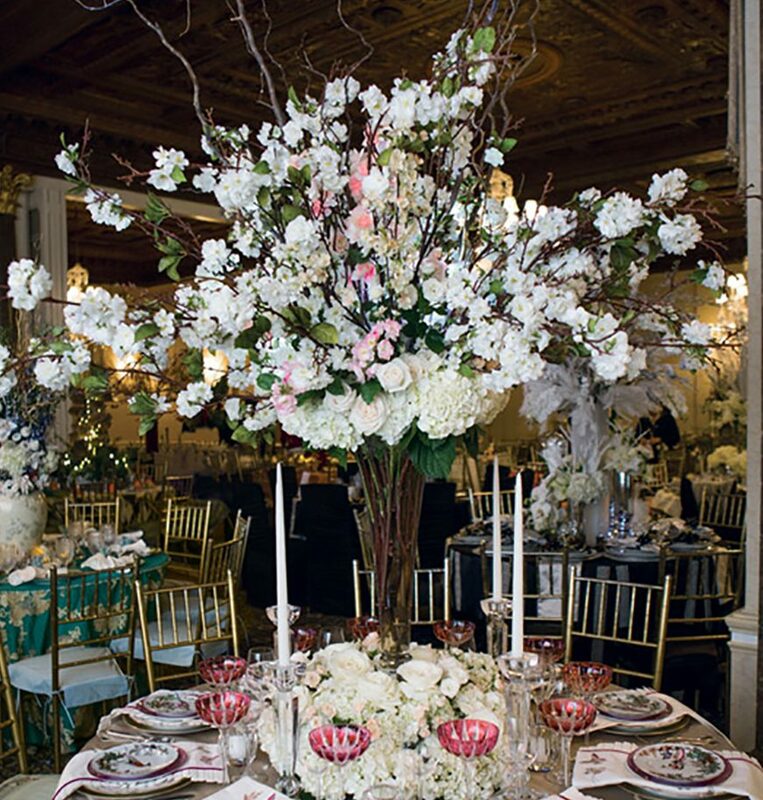 The over-the-top tall arrangement of cherry blossoms, hydrangeas, roses and branches in a slender vase (to not impede cross-table conversations) grows out of a low arrangement of roses and hydrangeas. To add a glow to the table, water-resistant, battery-operated lights were intertwined among the flowers. “I wanted the overall effect to be that of a pretty, elegant springtime event,” Alston says. If she were to design a similar table at home rather than for an event, would she make any changes? Perhaps fewer people at the table and a pared-down floral arrangement. 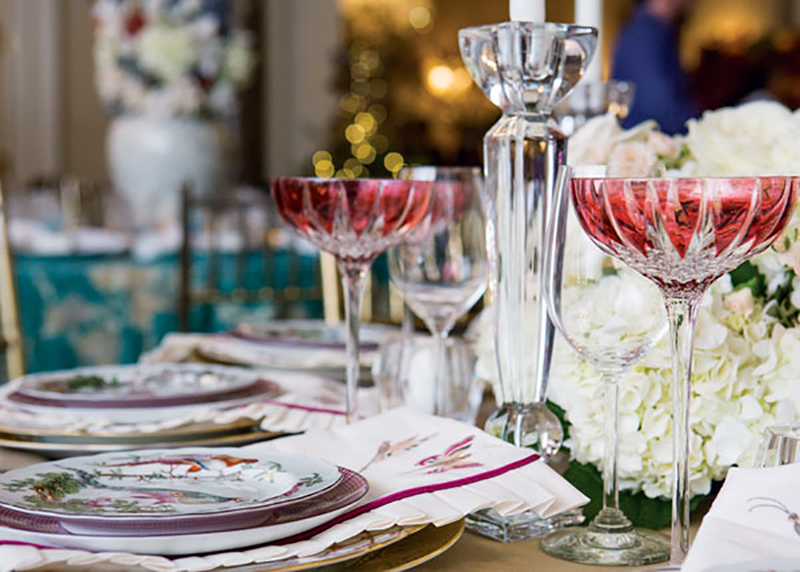 Design, Jo Ann Alston of J. Stephens Interiors in Far Hills; floral designs, Laura Clare Design in Bernardsville, Hoboken and Summit; china, Mottahedeh Inc. in Cranbury; flatware, Christofle in New York City; candlesticks, Crystalite Bohemia Inc. in New York City; napkins, designed by Jo Ann Alston with Tramore II fabric in white by Robert Allen Design, Silk Prism cording in magenta from Beacon Hill, hand-painting by Valerie Lynn Designs through the designer and fabrication by Martin Albert Interiors in New York City; table skirt, designed by Jo Ann Alston with Padova fabric in sand by Cowtan and Tout and fabrication by Martin Albert Interiors.